In the CRC Handbook of Laser Science and Technology: Supplement 2, experts summarize the discovery and properties of new optical materials that have appeared since the publication of Volumes III-V. Included are the latest advances in optical crystals, glasses and plastics, laser host materials, phase conjugation materials, linear electrooptic materials, nonlinear optical materials, magnetooptic materials, elastooptic materials, photorefractive materials, liquid crystals, and thin film coatings. The book also includes expanded coverage of optical waveguide materials and new sections on optical liquids, glass fiber lasers, diamond optics, and gradient index materials. Appendices include Designation of Russian Optical Glasses; Abbreviations, Acronyms, and Mineralogical or Common Names for Optical Materials; and Abbreviations for Methods of Preparing Optical Materials. Extensive tabulations of materials properties with references to the primary literature are provided throughout the supplement. The CRC Handbook of Laser Science and Technology: Supplement 2 represents the latest volume in the most comprehensive, up-to-date listing of the properties of optical materials for lasers and laser systems, making it an essential reference work for all scientists and engineers working in laser research and development. 2. CRC Handbook of Laser Science and Technology Supplement 2: Optical Materials (Laser & Optical Science & Technology) [Hardcover] Weber, Marvin J. 3. 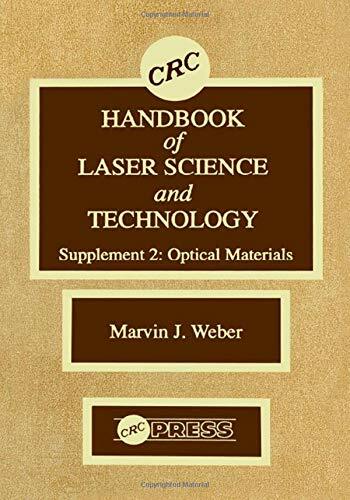 CRC Handbook of Laser Science and Technology Supplement 2: Optical Materials (Laser & Optical Science & Technology) [Hardcover] Weber, Marvin J.